I love this cover because it captures the setting, tone, and major themes of my novel. Set at Fort Carson and in the Denver suburbs four months after the protagonist’s return from Afghanistan, Road is a story of healing, transformation, reconciliation, and return. Road begins with a man and his family at a figurative crossroads. The protagonist is Fitz, an Army master sergeant with nineteen years of service including numerous combat tours dating back to Desert Storm. As the book opens, we find Fitz battered, bruised and hungover after a DUI accident the night before, and it’s clear that while he’s healed physically from the IED attack that cut short his last Afghan tour, his psychological injuries continue to fester. Devastated by the loss of his friend Peterson, a gifted medic who was killed in the blast, Fitz turned to alcohol to dull his pain. But his solace proves fleeting when the DUI leaves Fitz one screw-up away from a court martial and he comes home to find his wife Jenn packing her bags. Left alone as his downward spiral nears rock-bottom, Fitz must choose between numbing his pain and losing both his family and his career, or confronting the very memories he wants to forget as he comes to terms with his role in Peterson’s death. One of the things I love most about Road’s cover is that it shows us not just the road ahead, but also a blurry glimpse at the road already traveled. By featuring the rear-view mirror so prominently in the design, the cover hints at the problematic role of memory and hindsight in recovery from trauma and loss. In Road, Fitz’s journey is as much about making peace with the past as it is about forging a new future for himself and his family. If there’s anything a cover reveal like this proves, it’s that, while being a writer can be at times a lonely gig, it can take a village to publish a book. Even “indie” writers like me often depend on a team of people who pitch in along the way. If publishing a book is like a construction project, a traditionally-published author gets to use a general contractor (the publisher) to handle most of the details and manage the process from acquisition and editing to publication and marketing. A self-published indie author must be her own general contractor and project-manage all the different elements of the book’s production to ensure that the final product looks great, inside and out. The old adage, “Don’t judge a book by its cover,” is a lie. Regardless of whether a book is going to be sold online only or in brick-and-mortar bookstores, too, a book needs an eye-catching cover. Whether we as book buyers are browsing the shelves or scanning the search results on Amazon or BN.com, a book’s cover is the first thing we see and offers the first hint of a book’s content. As I set out to find cover art for Road, one thing was certain: I needed professional help. I had an idea — well, more of a swirling blob of vague impressions, to be honest — but I have zero talent when it comes to art or design. So after looking at a dozen websites with “pre-canned” cover art but failing to find anything remotely suitable to the story I told in Road, I decided to bite the bullet and hire a designer, Mark Aro of Hyperactive Designs, to craft a custom cover for me. And I couldn’t be more thrilled with the result. A traditionally published author has the benefit of an army of people who help take her rough draft, streamline it, and polish it into a clean, crisp final manuscript. A self-publishing author like me must find that sort of help herself. In my case, I used a team of alpha and beta readers — most of them reader and writer friends of mine — to read rough, developmental drafts (in the case of alpha readers), or edited drafts (in the case of beta readers). After I incorporated alpha/beta reader feedback, I hired a freelance editor, Jessica Swift, to copyedit the manuscript. I’d contacted a number of editors before reaching out to Jessica, but her immediate enthusiasm for my story and its subject matter caught me by surprise (in the very best way). An experienced editor who left California to set up shop in the woods of Vermont, Jessica connected with Fitz’s story with a passion and a depth that left no doubt that she’d help me make Road as tight and strong a book as possible. In this world of e-commerce, ebooks and print on demand, a book manuscript is little more than a wad of electrons. It doesn’t matter where your publishing business partners are, as long as you both have an internet connection. My cover designer, Mark, lives in California and my editor, Jessica, is in Vermont, while my alpha/beta readers hailed from all over the U.S. and Canada, and from as far away as County Antrim, Northern Ireland. So when it came time to select an interior designer to help me typeset the book and format it for print and ebook, I looked for the best fit, regardless of location. I ended up choosing a husband/wife team in Hobart, Tasmania (yes, really — Tasmania!) who run a publishing services firm, Polgarus Studio. Once the formatting is complete, I’ll be able to give my designer Mark a final print page count, he’ll adjust the spine dimensions accordingly, and I’ll be able to order a paperback proof. By this time next month, I should have Road uploaded to Amazon and available for my readers to buy in paperback or on Kindle. “Self-publishing” is a bit of a misnomer, implying that that writer literally does every single thing for himself. In fact, most of us enlist the help of a team of people to ready our book for prime-time. The core challenge of self-publishing is knowing when and what to outsource, picking the right partners, and successfully managing the process from first draft to publication and beyond. 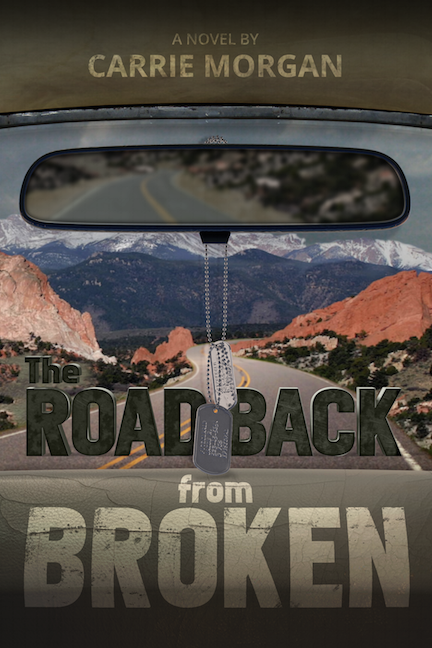 My novel, The Road Back From Broken, will be published in late October 2015 and will be available through Amazon in paperback and on Kindle. You can add it to your Goodreads “Want to Read” shelf by clicking here.